If you don’t have a good FTP program, or otherwise know how to set it up on a computer that isn’t your own, it is ugly to use. UGLY. So I would recommend Dropbox, or Box, or some other free online storage service. Make sure you put the file in your public folder, and copy the link to give to me. Coming up with interesting analog synthesis instruments takes some practice and experimentation. To get you started, I’m outlining a basic work procedure. As you get more experienced, you can make changes to this process and try more techniques. Start with an interesting sound source generator. Apply a filter (or some other process). Add envelopes and LFO modulation to synthesis parameters. Now to go a little deeper. At the top of any synthesis chain in Absynth (or any other synthesis program) is a sound generator. Typically, these generators take the form of oscillators, and Absynth uses the abbreviation OscA (and OscB, OscC). Absynth has a flexible generator that can go from a single oscillator, to modulation, to samples, to live audio input. Let’s start with the Single oscillator type, which has a selectable waveform. Focus on the elemental waveforms (sine, triangle, square, sawtooth, noise) and their filtered variants. The inharmonic waveforms can be of use as well. In the beginning it will be easier to start with a wave rich in frequency content (anything but a sine, and less likely to be a triangle). With a rich sound source, you can apply filtering with modulation to get interesting results. Try selecting the different elemental waveforms to hear the difference between them. Filters provide a way of boosting and cutting the amplitude of specified frequency ranges, which can alter the timbre of the sound over time. Click on the left-edge title bar to add a filter to the synthesis chain. The default filter is a LPF 2 Pole, which stands for Low Pass Filter with a two sample filter delay, providing for a 12 dB per octave slope after the cutoff frequency. More poles (4 and 8) provide a steeper response slope (24 dB and 48 dB per octave, respectively). Stick to the filters with the pole designations for a more analog style design and sound. Adjust the filter frequency and resonance controls. Start with the filter frequency. Sweep the cutoff frequency up and down to hear how the sound can brighten and darken. Now add varying amounts of resonance and do the filter frequency sweep again. The more resonance you have, the more amplitude boost you get at the cutoff frequency. That boost can give you a sense of cycling through the partials/overtones, as a partial will jump out when the cutoff frequency sweeps past it. Try LPF’s with additional poles. Always be listening to the result of these manual controls. Any parameter you can change in the patch window can be automated through the use of envelopes, LFOs, and MIDI performance controls. Once you have experimented with manual changes to filter settings, start adding and editing envelopes. Switch to the Envelope view. If you command-click on the Envelope tab, the envelope window will pop out as a separate window. You can do with with any window. When you create a new sound, Absynth provides initial ADSR amplitude envelopes for oscillators A, B, and C (whether your have all three oscillators active or not). You can drag breakpoints to lengthen/shorten attack, initial decay, and release times. You can also adjust the sustain level. To create the impression of a short, accented attack, you should drop the sustain level -6 to -12 dB below the attack level. For sounds that fade in, or have legato attacks, your sustain level will usually be the same as your ending attack level. Add envelopes to control filter cutoff frequency, and maybe resonance. A good thing to start with for filter frequency is to copy your amplitude envelope and paste in into the filter frequency envelope. Brightness and amplitude usually track together, or in related ways. Your envelope for filter frequency will be a percentage of whatever value you specify in the patch. For example, if your cutoff frequency is specified at 10,000 Hz, then the maximum value for the filter frequency envelope will be 10,000 Hz. If you set your sustain level lower than maximum, the filter frequency will be lower than 10,000. You can click on a breakpoint in the envelope to see the frequency value at that point. You don’t have to start at 20 hz, nor do you have to move to the maximum amount you set in your patch. You can experiment with having your filter decay faster than your envelope, or fade in slower than your envelope, for different effects. You can also link the filter envelope to the amplitude envelope for that oscillator (or anything else), so that you only have to edit one envelope to change both. In addition to envelopes, you can apply LFO (Low Frequency Oscillators) to any parameter of your patch. Try applying an LFO to channel pitch, oscillator amplitude, filter frequency, or filter resonance. You specify LFOs through the LFO tab. You can choose a waveform (noise waveforms have a random quality). To hear the effect of the LFO, you select the channel (A, B, C) of any parameter you want to modulate, and set the amount of modulation. Any modulation will be a reduction in the max amount, except for pitch, which will oscillate above and below. Specifying the frequency of the LFO is backwards from how you specify frequency of a filter cutoff. Absynth thinks in terms of the duration of one cycle of the LFO, which is quite useful for creating rhythmic effects (you can specify duration in seconds or beats, but beats only works within a DAW host like DP). To make an LFO oscillate faster, you must make the duration value less. A 1 second duration is 1 Hz; a 0.5 second duration is 2 Hz, etc. You add MIDI controls in the Performance tab. Within this tab, there are three important sub-tabs: Controllers, Assignments, and MIDI. Start with the MIDI sub-tab. You assign key velocity to control synthesis parameters from within this sub-tab. Start by assigning velocity to control Oscillator amplitudes. You can experiment by having it control one oscillator more than another. Next, consider assigning velocity to modulate filter cutoff frequency, as sounds tend to get brighter when they get louder. You can also control Modulation Index if you are using FM synthesis. It can interesting to try using velocity on less obvious parameters, like LFO frequency. You could control LFO frequency with velocity, and invert the mapping depending on how you want frequency to respond. The MIDI sub-tab also allows you to set your pitch bend range, and assign a controller to volume and pan (typically 7 and 10). Move to the Controllers sub-tab. Here you will find 12 Macro controls, along with the modulation wheel, channel volume, and pan. You assign an external MIDI CC to macro controls. You can do this by using the Learn function for each macro control. I generally set these to match the controller I’m using. You have to set them for each saved voice. Finally, move to the Assignments sub0-tab. You use the assignments sub-tab to assign macro controls to various synthesis parameters. Select a macro control from the list on the left, and the choose add to have it control a synthesis parameter. You control how much change a source applies, etc. You can have one macro control affect multiple synthesis parameters. Once you assign a macro control, the name of the control changes to match the first parameter to which it is assigned. It will still show the MIDI CC number of the control. Due Saturday, June 14, by midnight. Compose a short work using virtual analog synthesis. The duration requirements will vary depending on how much of your previous project work you choose to include in this project. If you are creating a new project with little to no integration of material from previous projects, then the required duration is between 1:15 – 1:30. If you are incorporating significant elements of your previous two projects, then the required duration will be 2:00. Material created with analog synthesis techniques in Absynth will occupy a significant portion of this final project. You will need to create at least three virtual instruments in Absynth, and each instrument will need to respond to three additional MIDI performance controls beyond note/pitch. Such controls could include key velocity and MIDI Continuous Controllers (CC), all accessed via the Performance tab in Absynth. You should consider controlling things like filter frequency cutoff, LFO rate, LFO depth, envelope rates, oscillator tuning parameters, and other things like that. Form again does not have to be much of a concern. It is allowable to make use of more repeated patterns and repeated phrase material, provided you include some artful/interesting sound parameter transformations over time, and/or interesting sounds within patterns. The listening examples by Devine, Tobin, and Eno can help guide you. Include all Digital Performer files, Absynth instruments, and audio files in a single folder, with your name as part of the folder name. The Bolte is available on SoundCloud (link provided above). The others are available for download as a single zip file on my iLocker. The Chowning works are more traditional (experimental) concert pieces. Bolte’s piece is something of a hybrid. It’s a concert piece, but uses a much more regular rhythmic structures than the Chowning. Devine, Eno, and Tobin fall into a more popular form of electronica, but all produce excellent and well-crafted works. Eno is known for his “ambient” compositions, and Matta is a good example. Listen for the subtle changes in timbres, tuning between notes, etc. Devine and Tobin fall into a sub-genre often referred to as IDM (“intelligent dance music”). Both Devine and Tobin use a lot more sounds, with more extreme modulation controls, than Eno. Modulation synthesis allows for the creation of complex spectra from simple waveforms. Absynth includes FM synthesis as a source/generator, and ring modulation as a process (with a fixed frequency modulator). You can read about modulation synthesis in this previous post. I’ve already outlined some basic synthesis controls, as they are used in kontakt. Here’s a previous post that outlines synthesis in general. Having posted about controls and filters already, it is especially useful to look at the generators section. For a quick overview of Absynth, visit this post. I will post more about Absynth soon, especially as it covers modulation routing and performance controls. Kontakt, like many virtual (software) instruments, can run as a standalone application or within a DAW host, such as Digital Performer (or Pro Tools, Logic, Ableton Live, etc.). When it is running within a DAW, we refer to Kontakt as an instrument plugin, similar to an effects processor. DAWs handle instruments plugins in slightly varying ways. Digital Performer has a special track type for instrument plugins, called an instrument track. An instrument track in DP accepts MIDI as input, and outputs digital audio directly to an output or bus. Audio from an instrument track is not recorded unless you route the output of the instrument track (using a bus) to an audio track. It is easier to do initial editing in Kontakt running in standalone mode. You don’t have the added processor overhead and window clutter associated with a running DAW, and MIDI inputs and Audio outputs are setup directly in Kontakt without any other intervention. Once you have created some individual instruments that you like, you should set up multi-instruments, or racks in Kontakt. A rack of multi-instruments, properly saved, contains any number of instruments (1 – whatever your computer can support) that load together. Given the way that Digital Performer accepts Kontakt audio output, it is best to setup racks containing instruments that you want to play and control as one. You can setup a rack with only one instrument, if that instrument is intended to be played independently. Or you can setup a rack of several instruments if you want to play them together and combine their outputs. Your instruments in your rack should be set to appropriate MIDI channel inputs. You should not use omni inputs for instruments to use in DP. Even if you want to play multiple instruments at the same time, you may want to keep them on separate MIDI channel inputs, as that will allow to vary the combination of instruments playing at any given time, which can be used to create more compositional variety. Saving your multi-instruments/racks will save the individual instruments as well, and any output settings. I would recommend saving as monolith, even though this will make yet another copy of your audio samples. Saving as monoliths just makes it easier to transfer files between computers. Also note, that although saving a rack saves all the individual instruments in the rack, to load these instruments individually or in other combinations requires you to save each instrument individually. Launch Digital Performer. Open a new project. You can reimport any audio you want to from your previous project. When you create an instrument track assigned to Kontakt, it will open an effects window with the complete Kontakt workspace. Load an instrument from the browser or file icon, or load a multi-instrument/rack. Check the MIDI channel assignments for each instrument. You should set each instrument to listen to a specific MIDI channel. Don’t use the Omni setting, which listens to all MIDI channels. You want to have the ability to individually address instruments. If I have multiple instruments in my rack, I usually assign them each their own MIDI channels. If I want to send commands to all of them, I copy the information to all the tracks. But if I want to send to only a subset, I can. You can have more than instance of Kontakt loaded in DP. Repeat the above steps as many times as you need different Kontakt instruments. It really helps to name your DP tracks, especially your instrument and MIDI tracks. Instruments are selected as a source by their track name. MIDI tracks can be individually edited in the MIDI tab view, and you select a track to edit by choosing its name from a drop down menu. Option-click on any track name (including folder names) to change the track name. Using the Tracks view makes it easy to see audio outputs and inputs, and MIDI outputs and inputs (and to rename your tracks). By default, MIDI inputs are not shown, because MIDI tracks listen MIDI input from all connected MIDI devices. The output is important. If you followed the instructions for setting up the instrument and MIDI tracks, you should have MIDI tracks that send information to the instrument you want. A MIDI output is listed, in the case of an instrument, as the track name of the instrument, possibly a number denoting the instance of the instrument (1, 2, 3, etc. if you have multiple Kontakt instruments), and the MIDI channel being sent to the instrument. This last number, the MIDI channel output, has to match what your instruments in Kontakt are set to for input. If you record enable a MIDI track, the incoming MIDI commands from any device are routed to the assigned output of the track. If the instrument is play enabled, you should hear output from Kontakt, via Digital Performer. The key to using Kontakt is to understand the hierarchy sample to instrument to rack, and how to use effects and modulation sources. Kontakt uses the metaphor of hardware samplers in a rack. As part of this rack, Kontakt includes a multi-purpose browser (files, libraries, etc. ), an output mixer, and an onscreen keyboard that can be used to trigger notes without an attached MIDI keyboard. Program menus are sparse. You are limited to program preferences (which can also be accessed from the rack, under options). Since Kontakt can also function as a plugin instrument within a DAW, having commands built in to the interface is preferable to menus. When an instrument is loaded, you click on its wrench to open the editor. For beginning purposes, close the sections that deal with Instrument Buses, Insert Effects, and Send Effects. It’s easiest to explain this moving from the lowest level of an instrument upward. Samples: individual audio files, stored either as aiff or wav files on your computer. Zone: a sample mapped to the keyboard, with key range, volume, pan, and tuning settings. You can edit zones within the Mapping Editor. Within a zone, you can also edit files to set sample start and end points, and multiple loops within the Waveform Editor. Note that you must have a zone selected in the mapping editor to show its corresponding audio file in the waveform editor. Group: multiple zones combined. Most instrument programs will only have one group. Most audio processing and control takes place at the group level through group insert effects, MIDI CC, LFO, and envelope control. Groups are divided into the source module (how the sample is played – DFD, Sampler, Tone Machine, Time Machine, etc. ), the pre-amp group insert effect chain, the amplifier, the post-amp group insert effect chain, and modulation sources. We will focus on the source, group insertFx, amplifier, and modulation sections. Instrument: one or more groups with combined instrument insert effects and send effects. The instrument signal path includes the instrument insert effect chain, the instrument send effects (in parallel), and the instrument output. Each instrument can respond to its own MIDI channel, and also has its own volume, pan, tuning, and polyphony settings. Multi-Instrument: a combination of instruments in a single rack. Multi-instruments also include the aux sends, and the multi-output mixer, which includes effect plugin slots like DP. Effects include filters, EQ, and signal processing units such as chorus, reverb, distortion, etc. Some effects are only available at certain points in the hierarchy (group, instrument, send). Each point in the hierarchy also offers different controls and methods of computing. Group insert effects compute polyphonically for each note. Most parameters are controllable via a modulation matrix. For example, you can have the note number modulate the center frequency of a filter. Each note that gets played will have its own filter with individual filter modulation. Modulation routers appear directly under the module of a modulated parameter. You can modulate a parameter with MIDI remote (1:1 mapping of external control to value), MIDI CC (scalable mapping of external control), MIDI Note # (key position), an envelope, or LFO. The router shows the parameter being modulated, by what source, and by how much. Modulation sources (LFOs and Envelopes) appear at the bottom of the instrument in the Modulation section of the instrument. Here you control the modulators’ parameters. There are navigation buttons that allow you to jump from router to source, and vice versa. Kontakt can save individual instruments in one of three formats. It can also save a multi(instrument) rack (and its collection of instruments) as a whole. While saving a multi is useful for quickly loading an entire multi-instrument setup, unless you have also saved instruments in individual files you will not be able to access them separately from the multi. I recommend saving instruments individually, and then also saving any multi’s that you want to load quickly. Saving an instrument is always a “save as…” command in Kontakt. File management commands are found in the Disk icon, marked Files. You can edit the names of instruments in the instrument header, or you can rename an instrument while saving it. Although it leads to larger file sizes, and the copying of audio files that you already have, I strongly recommend using the “save as…monolith” option. That will save your patch/program info along with any digital audio used by the patch into one single file. If you save just the patch, or patch + samples, you run the risk of losing the digital audio you are using for the patch. A MIDI device is anything that can send and receive MIDI commands. From a practical standpoint, a device must include at least one MIDI port. Many current devices, like USB keyboard controllers, have multiple MIDI ports for sending and receiving data. A MIDI port can be either a physical, 5-pin MIDI connection, or a logical (computer defined) data connection made through a USB or other connector. Each port can communicate data on 16 MIDI channels. A MIDI channel is a logical data path for communicating information. All 16 channels travel on the same physical cable, but use channel status messages to sort data. A device that is listening to MIDI channel 1 will only respond to data that is sent with that MIDI status address, ignoring messages with other channel addresses. Using MIDI channels allows for routing commands to specific instruments. A MIDI program/patch/instrument is a definition of how to play specific sounds on a MIDI device. One program could play a piano sound; another program could play a saxophone sound. The three terms can be used interchangeably, but they can also have specific meanings for a particular device or piece of software. For our purposes, Kontakt uses the term instrument to define each sampler device in its rack. Most MIDI commands have data ranges from 0 – 127 (7 bit values). Noteon and noteoff commands are the most commonly used MIDI messages. A noteon command consists of the MIDI channel, noteon command, note number, and key velocity (how fast the key was pressed, corresponding to force). The data that you will focus on consists of the note number and key velocity. A middle C struck with full force would give a note number of 60 and a key velocity of 127. Lower key velocities would result from slower key strikes. A MIDI instrument has to be programmed to adjust amplitude in response to key velocities. Almost all synthesizer/samplers bypass the noteoff command in favor of a noteon command with a key velocity of 0. For example, a note number of 60 with a velocity of 0 would turn off a sounding middle C.
Continuous Controllers (CC) send data values that can change any number of instrument parameters. A CC command consists of the MIDI channel, CC command, CC number, and CC value, with our focus on the CC number and value. The Mod Wheel is a commonly used CC, assigned the controller number of 1 almost universally. You have to program an instrument to respond to specific CC numbers. CCs are used to change parameters while a note is sounding. Pitch Bend can be thought of as a special type of CC, although it has its own MIDI command. It allows for pitch changes to a note while sounding, up or down. You must program an instrument to respond to pitch bend, and by how much (how much is usually specified in semitones, or half steps). Kontakt implements a wide range of synthesis controls, including envelopes, LFOs, filters, and other processors. An envelope is a function that changes over time, applied to some audio parameter. The most common envelope you will use is the amplitude envelope, but envelopes can be applied to any parameter, including pitch, filter frequency, filter resonance, speed of sample playback, amount of an effect to be applied, etc. 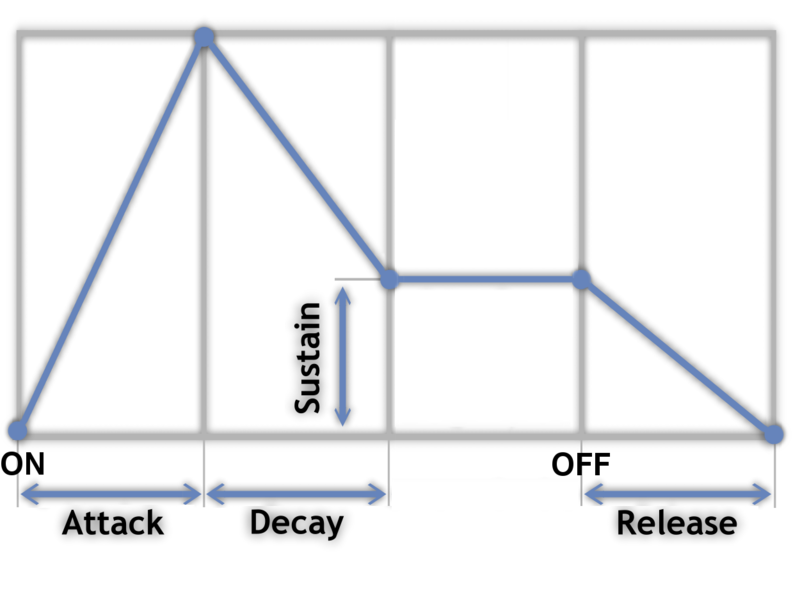 The most common envelope type is the ADSR: Attack, initial Decay, Sustain level, Release. A, D, and R describe time values – S is an amplitude level. Kontakt uses AHDSR envelopes, with H standing for Hold time at the end of an attack, before starting the initial decay. In its most simple terms, it can be visualized as pictured below. The attack starts when a key is pressed, taking the specified attack time to reach full amplitude. After reaching the attack, Kontakt inserts a hold time before starting the initial decay. The initial decay time specifies the time it will take to change from full amplitude to the sustain amplitude specified as the sustain level. Once the key is released, the release segment is triggered. The release time describes the the time it takes to go from the sustain amplitude to zero amplitude. Note that the release segment will start whenever a key is release, even if previous envelope segments have not completed. LFOs are oscillators that have frequencies below the range of human hearing. Although human hearing goes down to 20 Hz, these oscillators typically have frequency ranges from 0 – 100 Hz. Kontakt LFOs go above 200 Hz — not exactly an LFO, but it still limited in its frequency range. LFOs can provide periodic fluctuations, such as those you find with pitch or amplitude vibrato. Most LFOs have changeable, or selectable, waveforms. These waveforms are named after the shape of their amplitude function over time — sine, triangle, sawtooth, square. You can also have random LFO waveforms, which output random amplitude values at a specified frequency. Filters take a complex signal and attenuate or boost amplitudes of designated frequency ranges. Filters apply something similar to sonic sculpting, taking away parts of the sound and/or accenting parts of a sound. Filter types are named after the type of signals that are passed through unchanged. Lowpass filters allow frequencies below a specified cutoff to pass through unchanged. Frequencies above the cutoff are reduced or eliminated. Highpass filters allow frequencies above a specified cutoff to pass through unchanged. It is the opposite of a lowpass filter. Bandpass filters allow frequencies around a specified center frequency to pass through unchanged. Filters do not allow one frequency to pass through, and then fully eliminate an adjacent frequency. Instead, filters have attenuation slopes that describe their amplitude reduction over a frequency range. A first order filter (or 1 pole) has a slope of 6 dB per octave. A second order filter (2 pole) has a slope of 12 dB per octave. Bandpass filters combine the slopes on either side of the center frequency, so a second order bandpass filter has the same slope as a first order lowpass or highpass filter. Although it would seem intuitive that you would want the steepest slope to your filter cutoff, this is not always the best musical situation. Filters work by using delay lines to mix current and past output together. The steeper the slope, the longer the delay line. 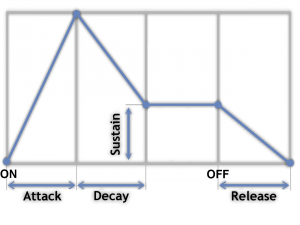 Longer delay lines can start to affect transient clarity and can create phase problems. In Kontakt, a 2, 4, or 8 slope filter uses feedback to produce a resonant amplitude peak around the cutoff or center frequency, which can accentuate the filter frequency. Kontakt provides you with a range of effects to change a sound in playback that are similar in many ways to the plugins available in DAWs like Digital Performer. For now, I’m going to stay away from these processors to focus time on learning how to use envelopes and LFOs in interesting ways. Modulation means change. Envelopes and LFOs are modulators, because when they are applied to a sound parameter, that parameter changes according to the parameters of the envelope or LFO. In Kontakt, you can also modulate sound parameters, and even modulator parameters, with MIDI information. It is typical to modulate amplitude through the use of Key Velocity (how hard/fast you press a MIDI key). Key Velocity mixes with an amplitude envelope to produce the actual amplitude for a note. You can set filter frequencies to respond to MIDI note number (Kontakt calls it Key Position), so that a cutoff frequency will always be the same distance from a played MIDI note. You can also use Continuous Controllers (CCs) to change parameters using rotary encoders (knobs) or sliders to change parameters. You can have a CC change envelope attack times, for example, or change the intensity (amplitude) of an LFO, or the frequency of an LFO. Using modulation sources will be crucial to creating interesting sounds, as interesting sounds change over time.